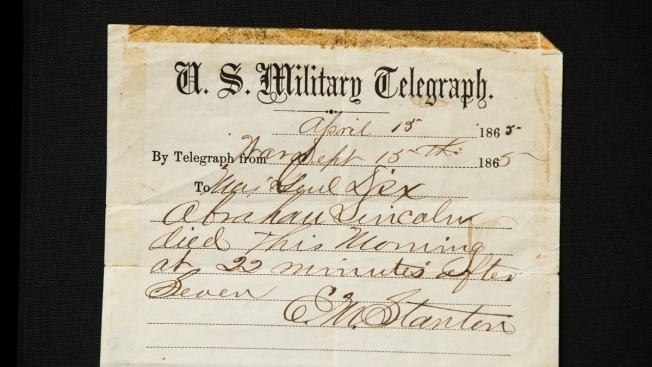 The telegram reads: "Abraham Lincoln died this morning at 22 minutes after seven"
This photo shows a handwritten notification of President Abraham Lincoln's death that is being offered for sale by Raab Collection in Ardmore, Pa., Thursday, April 11, 2019. The telegram was written inside a home where Lincoln was rushed after being shot at Ford's Theater on April 14, 1865. The handwritten notification of President Abraham Lincoln's death is being offered for sale by a Philadelphia documents dealer. Nathan Raab, president of the Raab Collection, says the telegram was thought to be lost, and calls it "truly one of our great finds." It was written inside the home where Lincoln was rushed after being shot at Ford's Theater on April 14, 1865. Secretary of War Edwin Stanton and Thomas Eckert, the chief telegraph officer, stood watch over Lincoln, who died April 15. The telegram reads: "Abraham Lincoln died this morning at 22 minutes after seven." Sally Field reveals how she and co-star Daniel Day-Lewis work together. Plus, Sally describes her physical transformation into Abraham Lincoln's wife, Mary Todd Lincoln. Stanton dictated the telegram to Eckert, who gave it to a runner to take to War Department telegraphers. The piece had been in the collection of a Civil War general's family for generations and is valued at $500,000. The 154th anniversary of Lincoln's assassination is Monday.